McMurray Musings: Who Is Wood Buffalo's Best Citizen? Who Is Wood Buffalo's Best Citizen? 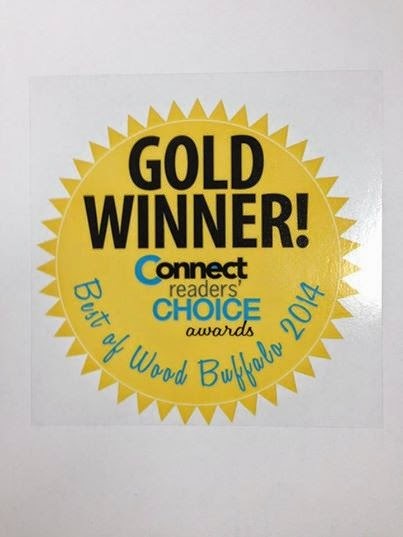 When I received the email indicating that I had been chosen for some honours in Connect Weekly’s annual Best of Wood Buffalo awards I was deeply touched. To be named Best Local Blogger was truly an honour, and as always I am so appreciative of those who not only read this blog but think enough of what I do to pencil in my name when asked who they thought was best in the local blogging biz (although I would note there are several other local bloggers who are amazing and I am proud to call many of them my friends). I was also touched to be named Local Must Follow on Twitter, although I suspect 1/3 of the people who currently follow me on Twitter are there for shoe pictures, another 1/3 to keep up to date on the antics of the Intrepid Junior Blogger and the family zoo, and 1/3 in the hopes that I will be enmeshed in some sort of melodramatic kerfuffle about tractors or the like. These two accolades are genuine honours for me, but it was the last one that truly got to me. You see, I was named Best Citizen, tied in votes with our lovely Mayor Melissa Blake and our longest serving councillor Phil Meagher – and all I can say is that people, you have it all wrong on this one. In case someone thinks this is some sort of false modesty and that I am over here preening myself over this Best Citizen business I want to be very clear: While I am deeply touched that people would think I am the “Best Citizen” I also know nothing could be further from the truth. I am not the Best Citizen, not even close – I am just a citizen with a name that people know. I know so many people in this community who are the best citizens – and yet I don’t even know their names in many cases. The nurses at the Northern Lights Regional Health Centre who saw me through my recent health crisis, gently placing IVs knowing that I was anxious and afraid? Best citizens. The folks at Starbucks in Stone Creek Village who greet me every morning with a smile and make my coffee? Best citizens. The many people in our service industry who deliver my pizzas, who make my restaurant meals, who sell me dresses and shoes and do so with great customer service and a smile? Best citizens. The people who run our social profit organizations and work in them at every level, meeting the needs of those who need their help? Best citizens. The moms and dads who are raising our next generation of leaders, who I see out at parks, on the trails and at events with their little ones, bringing them up with love and compassion? Best citizens. The people who touch my life every day in every way in ways both large and small, making my world a better place? Best citizens. You, reading this blog? You are likely the best citizen in this region in some way because in some way you contribute to making it a better place. Maybe you volunteer or maybe you do your job with a smile or maybe you just love this place we call home and do something to make it better. You are the best citizen, not me. I am just a citizen who has done some things because she loves this place and who happens to have a name a few people know, that’s all. I believe being part of a community means one very important thing: you have a responsibility to contribute to it. The contribution can be large or small. It can be as simple as keeping a beautiful yard, mowing your neighbour’s lawn or picking up random pieces of litter. Each and every one of those contributions has tremendous value because no one person (or three people as the Best Citizen award reflected) can dictate the nature of the community. Every single person in a community is part of the development of the nature of a community. Every single person has a role to play, and contributes to making it a better, or worse, place. So, here it is, people. I am not the Best Citizen in Wood Buffalo. You are. You are the one who makes this the place I want to call home. You are the one who inspires me to do what I do. You are the one who makes me want to share the story of the strength of our community, to write about our incredible home, to defend it when it is under attack and to promote it as a place that is far, far more than oil. You are the best citizen in Wood Buffalo, each and every one of you. To those who typed in my name for Best Local Blogger, Must Follow on Twitter and Best Citizen – thank you. I am genuinely touched and honoured, and not ashamed to admit that when I received notice of these honours I cried because the news came at a very low point for me when I was struggling with a serious health crisis and feeling quite defeated. I am humbled by your kindness, and I am truly grateful. Most of all, though, I am overwhelmed as my life is far, far from what I ever thought it would be and in the last three years has become far happier and far more satisfying than I ever thought possible. And it’s all because of Wood Buffalo’s Best Citizen – you.